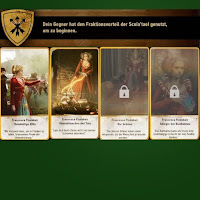 From the Map Collection you can sort for your chosen faction create your own cards in the cards set. The choice of the Group is at the beginning is not necessarily a matter of taste, but the strength of the unit cards (which among other things is due to the group-specific number of cards // 22 unit cards are the minimum). Cards can fraction bound, or be universally applicable. Unit cards make up the largest amount of cards. Special cards can also occur more than once, so that the probability to find them also among the top 10 starting hands is not too low. Hero cards are a tower of strength - they are affected by this command of special cards and count with 7-10 points to the big points charms. The specificity of special cards is not to be affected. However, they are also excluded from the doubling of "Horn of command posts". Players place one card per round (in each round is possible to fit). The broadcast with the most points wins the round. The size of the card set course affects the probability to get good map on hand. To sort before "weaker cards" (points value 2) of, you probably get the better cards to start the game. It must be filed (at the beginning 10 cards + 2 exchange card) according to the tactics and the Group property enough cards in the set. A ratio of special cards (max. 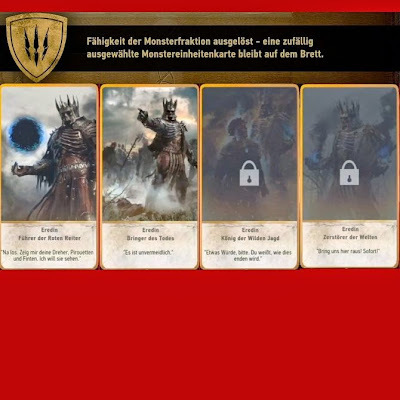 10 cards in the pack) to the rest of the cards can be selected, provided that you include special cards in his tactics with. 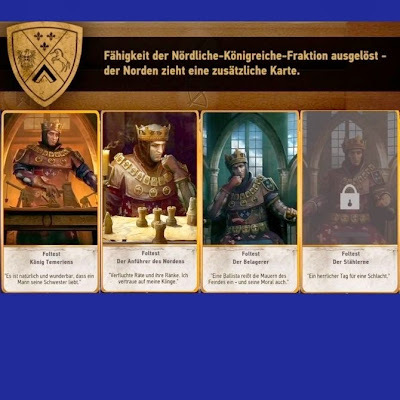 One could very well do without the special card "good weather", as long as the leader card "Foltest - The leader of the North" has been selected. When this card is only drawn to the conclusion that one can dispense with the other Special cards weather. Especially if you have a lot of hero cards. If one follows the tactics, aside possible special cards of the opponent - you need no large scatter in the unit cards. You could do everything on the melee, for example. This is very risky, because you certainly need that you can have the last move to pick up possible special cards weather. Leader Card "Emhyr var Emreis" (Empire Nilfgaard) picks up your leader cards ability! 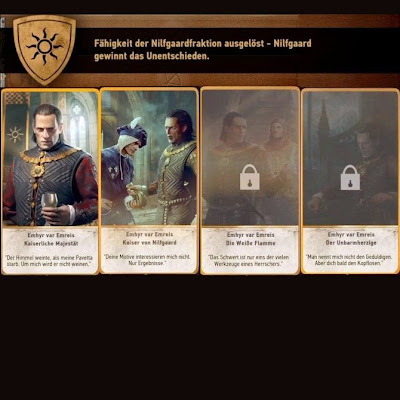 (Here, it is the tactic against Nilfgaard to change and accommodate the special card good weather in the sentence. The leader of the North - Removes the effect of special maps Weather; All units have full strength again // effect as Special Weather Map "good weather"
Pureblood Elfin - You can view the map "Biting frost"
Queen Dol Blathannas - Destroy the strongest melee unit of the opponent (provided that the total number of points is 10) // effect as special card "burning"
Group capacity: Before playing a round, the group can begin with the first train. Special feature: unit card with the "screening"; you may play all the same cards from your hand. Group capacity: After one round, one (randomly selected) card on the field is located. In the combination unit map "healer" and "close links" can provide an element of surprise. In the first round play only one of the "close relationship" s cards to then both play off (after the "healer" card "). 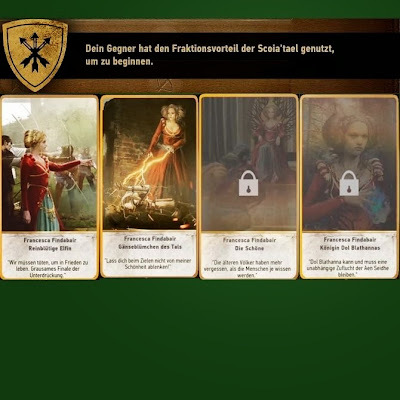 Below are a few simple exemplary opponents in Gwent game. 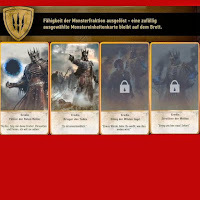 Playing against the Monster faction without weather maps is almost hopeless, as long as the opponent can often make use of its ability "screening" use (this card come from the draw pile). If an opponent with the screening card before, you can either fold, or wait until the end, that you can play a weather map. The Tavern keeper at the port of Novigrad plays Faction: Scoia'tael. The enemy starts by his faction advantage. The first round has been won quite lossy. The fraction advantage thank the card advantage is reduced in the second round to one. In the second round of the opponent plays his advantage from the card pattern. There remains only the retreat. Why the AI still plays out one card at a 21-point lead - remains a mystery. The third round is with a lot of luck in a 5-point victory at Gerald. Phu.